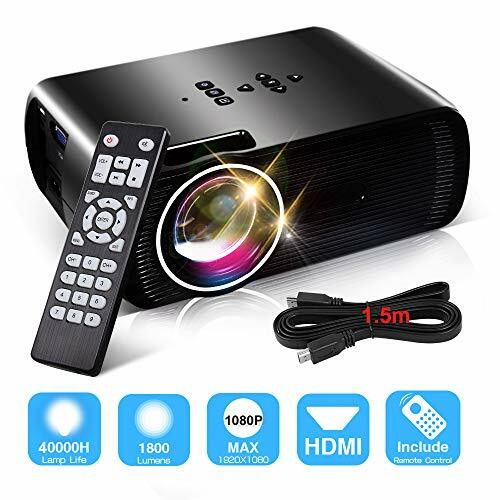 Konomio LED Mini HDMI Video Movie Projector Bring You a High Quality Big Screen Ultimate HOME THEATER Experience to Enjoy Your Home Entertainment and Family Time ! Updated fan brings less noise. It won't disturb you while watching the movie or do business presentation even in quiet room. Connect to PC via VGA jack; hook up to headphone / outer speakers via Audio port; Insert U-disk / hard disk device into USB slot. Native Resolution of 800 x 480 pixels.Supported 720p and max and resolution of 1920 x 1080 pixels. Adjust lens and keystone before operating the projector. Displaying the content in the dark places is recommended. 1) To connect Konomio mini video projector with iPad or smart phone, you need a wireless HDMI adapter. (A MHL to HDMI cable for android phone and a lighting to HDMI adapter cable for iPhone/iPad). 【50% BRIGHTER THAN ORDINARY LED VIDEO PROJECTOR】Konomio Led Movie projector is ideal for home entertainment in dark, more brighter than ordinary led projectors.especially for movie night, party etc. It gives you a cinematic viewing experience with highest resolution, support 1080P brightness 1800 Luminous Efficiency Contrast:1000:1.The best of gift for Father's Day. NOTE:an updated version,but the updated packaging has not been made,so we used the original packaging,please don't surprised. 【MULTIMEDIA INPUT & MHL CONNECTIVITY】 Enjoy the bigger & clear screen via HDMI port/ VGA port/ USB port/ AV port/SD Card slot and 3.5mm audio jack(headphone/external audio device) to connecting your PC / Laptop / DVD Player to enjoy videos, movies,or football matches. Connect your Play station PS3 PS4 or X-Box ONE to enjoy games. With wireless HDMI dongle(not included), you can connect your smartphone (support MHL function)/ ipad to the projector. Perfect and convenient for home entertainment. 【IMPROVED SYSTEM & REDUCED NOSISE】Konomio HDMI video projector comes with powerful cooling system and lower noise due to development and improvement of cooling system design and innovative materials applied. Please be kindly advised that an external audio device will increase the volume of the movie or music displayed and reach the optimum watching experience. 【LONG LASTING LAMP LIVES & WORRY-FREE RETURN】The newest type of LED lamp works over 40,000 hours without repair or replacement. even if you watch a two-hour movie every day, your projector's lamp should last many years. 3-Year guaranteed warranty is offered which consists of free replacement or refund. If you have any further problems with this Konomio LED Projector, please feel free to contact our 24/7 customer support via email or our Facebook homepage. If you have any questions about this product by Konomio, contact us by completing and submitting the form below. If you are looking for a specif part number, please include it with your message.